Thank you for your support during this difficult time. Please enhance this tribute to Frank Louis Toth by adding your memories and photos. 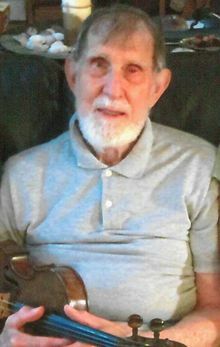 Frank Louis Toth, D.P.M., age 78, of North Royalton, Ohio; beloved husband of Erika J. Toth (nee Weintz) for 48 years; loving father of Robert Toth, Pharm.D. ; brother of Julian Toth, and brother-in-law of Philipp Weintz (Margaret); uncle of James S. Toth, Susan Adams (Brad), Karen Keller (Scott), Laura Meyer, D.O. (Mike), John Weintz, M.D. (Christi), and David Weintz (Natalie), and great-uncle of many. Frank was a graduate of Cleveland West High School, Case Western Reserve University, and the Ohio College of Podiatric Medicine. Frank was a retired Podiatrist, having operated his private Podiatry practice for 25 years in Lakewood and Cleveland. He was an avid musician and violin player, and greatly enjoyed audio and video recording local music groups and orchestras. Frank also had a passion for amateur radio operating, fishing, and collecting phonographs, red Farmall model tractors, and model trains. Frank passed away on Sunday, March 3, 2019. The family will receive friends at the BUSCH FUNERAL HOME, 7501 Ridge Road, Parma, from 6:00 P.M. to 9:00 P.M. on Wednesday, March 6, 2019. Funeral service at the funeral home on Thursday, March 7, 2019 at 10:30 A.M. Entombment will follow at the Brooklyn Heights Cemetery Mausoleum in Cleveland, Ohio. Frank Toth was my best friend from grade school, through high school and for the rest of our lives. We helped each other through some difficult times. We shared many interests including classical music,electronics, audio equipment (we built many kits) and just getting out and walking in the woods. He was devoted to his wife Erika and his son Robert. We will all miss him terribly and he will never leave my thoughts. Farewell Frank and thanks for being such a wonderful friend. Dear Erika, Robert and family : So sorry to hear of Frank's passing. May you find comfort and peace in your memories. I am Fred Houk's sister. I have many fond memories of Frank coming to our house. He helped me many times with my algebra homework. He was very patient and understanding and a true friend to my brother. My sincere condolences for your loss.